The sensewhere Software Development Kit (SDK) for mobile platforms is the client portion of sensewhere’s innovative positioning sub-system that can be integrated into existing or new mobile applications. The SDK is currently available for Android 2.2 and newer. The SDK has been designed to be easy to integrate into mobile applications with flexibility for the developer to control various parameters affecting position accuracy, data usage and power consumption. The server component of the solution is live and managed by sensewhere. The SDK has been used successfully in consumer mobile applications with hundreds of millions of active users. 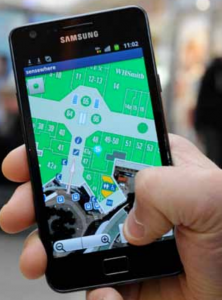 The sensewhere EValuation Kit (EVK) is an Android mobile application that uses the sensewhere SDK for accurate indoor positioning. The EVK displays position results on indoor maps (where available) and has basic controls for visualization and testing and can be used to log data. The EVK allows developers to evaluate the performance of sensewhere technology and to compare operation with applications developed using the SDK.